This post contains affiliate links. If you purchase an item through these links I may receive a commission at no additional cost to you. You can read the full disclosure here. Thank you for supporting my blog! I started this project back in February. 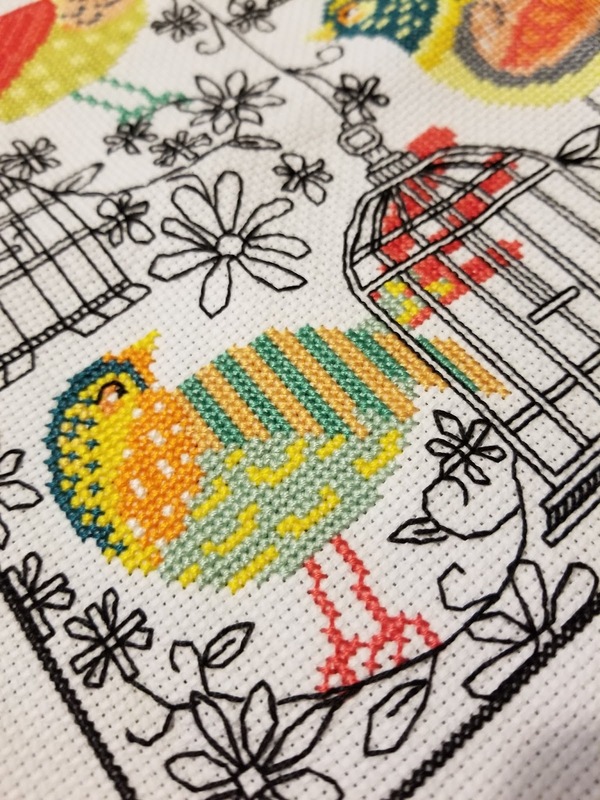 I'm not very good at keeping up with how many days or hours it takes me to stitch, but it took me a bit over a month to stitch this piece. 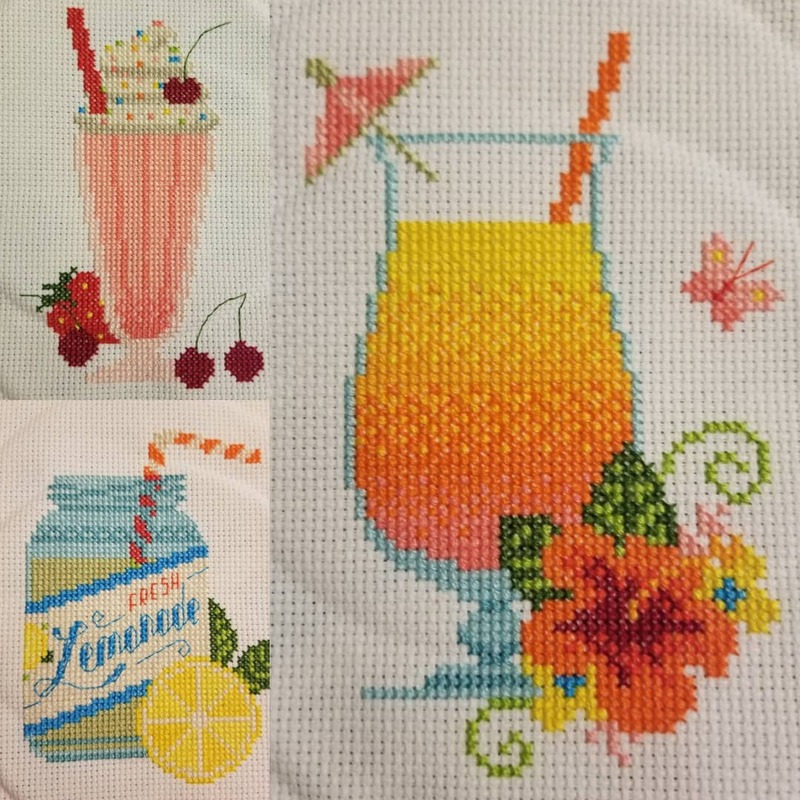 I purchased the magazine just so I could have this specific pattern and I'm glad I did! The designer finished it as a pillow, but I will be framing mine...eventually. I don't like to turn my completed pieces into pillows and such because around here it would get damaged or attract a lot of cat hair and dust. I prefer my Cross Stitch to be protected behind glass. I absolutely love the bright colors in this piece. For some reason, I'm always drawn to birds, flowers and bright colors. This pattern can be found in the September Issue 2018 (Issue 335) of Cross Stitcher Magazine. It's titled Tres Joli and designed by Felicity Hall. Here are a few close up pics. 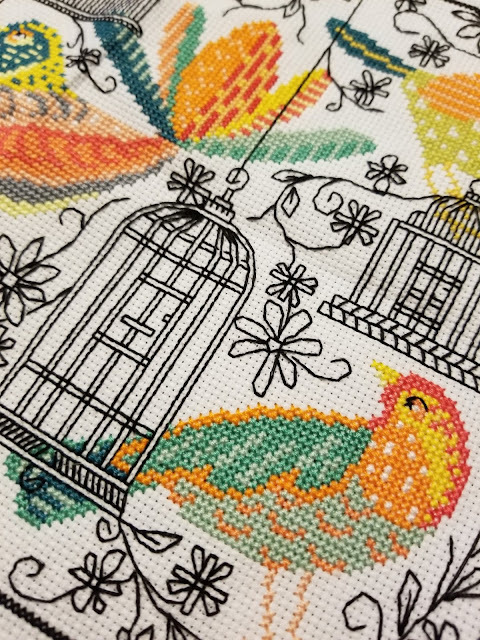 If you stitched this piece, I would love for you to share a link to it in the comment section! I realized a couple of weeks ago that I haven't been very happy. We've had a lot of ups and downs lately, but I knew that something else was wrong. I struggle with anxiety and when things in my life feel out of sorts... it gets worse. 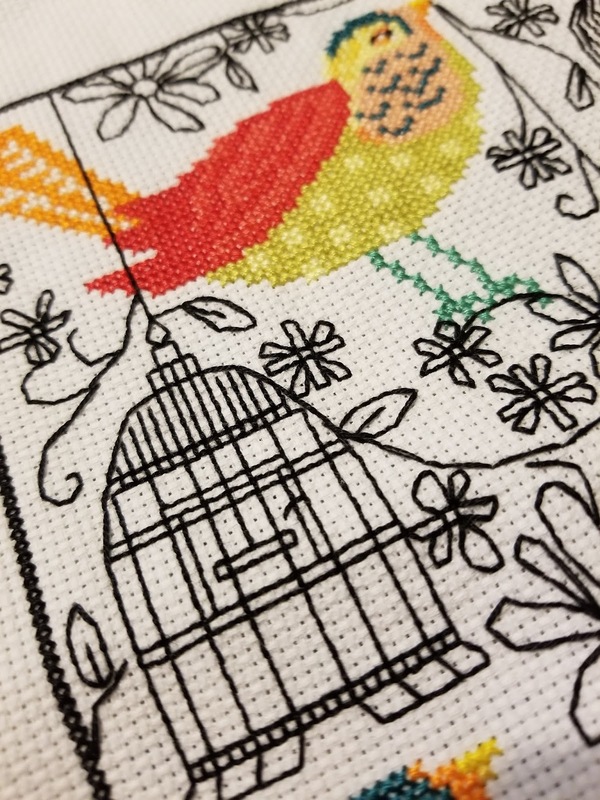 The only way I have found to calm it down is to work on my Cross Stitch projects. I've always... jokingly... said, "It keeps me sane." But, in some ways, it does. After I've enjoyed my stitching for a couple of hours, I always feel better. I came to the conclusion that this is something I enjoy very much and I have to make more time for it. 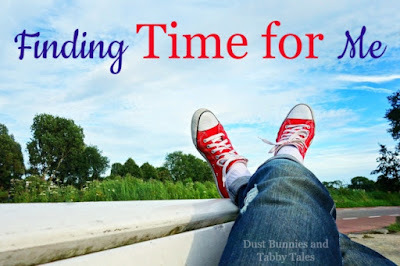 I also realized that I truly missed blogging. I knew I had to find a way to make more time for both of these in my daily life. This got me to thinking. How do I make more time? A website I came across made the suggestion that I need to make myself a priority. I've never made myself a priority. I have a 20 year old son and an 18 year old daughter. I've always made sure to be there for them as much as I can. I've probably been more involved in some areas than I should, but that was my goal to always be there for my kids. Since they are older now, I guess they need me less, but it's really hard for me to let go and not be there every step of the way. Maybe it's time for me to step back... just a bit more... and let them be adults. I've been a homemaker since they were babies and I rarely fix my hair or put makeup on. I usually only do these things if I'm going out in public so I don't scare everyone. :) I should probably try to do that more often. My poor husband. I'm glad he loves me as much as he does. I know that I should do this for myself, but I'm sure he would love coming home to a wife that's doesn't look frumpy relaxed all the time. Another suggestion was to wake up an hour earlier than I do now. I've tried this and so far it hasn't worked for me...consistently. For some reason, I haven't been able to sleep well at night so I end up hitting the snooze button over and over again. It's also hard because I'm waiting up a bit late to make sure my children make it home safely. However, on days that I have accomplished getting up earlier, it feels great to get everything done that needs to be done! I feel like I have so much extra time! This is probably my biggest hurdle. It seems this is a bad pattern that I have... actually getting started. Once I'm going... I'm good. Unless, I need a nap. I'm sure there are more things that I need to work on to make more time for things that I enjoy, but I will start with these. My goal is to try to make myself more of a priority and wake up earlier. How do you find more time for yourself? 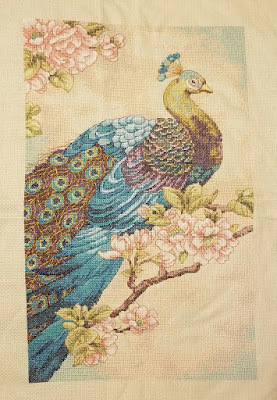 The last time I posted about my Cross Stitch projects, I was just beginning a large peacock piece and I've completed several more since then. 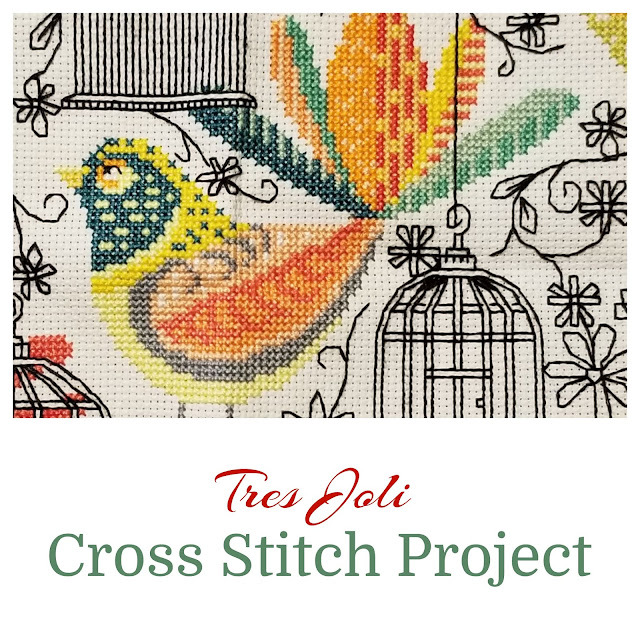 I'm getting close to finishing my current project and I have been sharing all of these on my Facebook page. I love how this Indian Peacock turned out! I'm still looking the perfect frame. 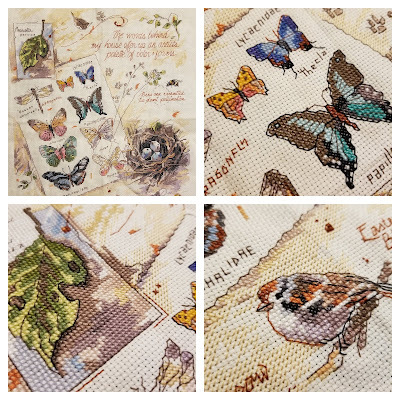 I wanted something quick to stitch after my large peacock piece, so I stitched up these cuties. They are super small and I haven't figured out what to do with them, yet. 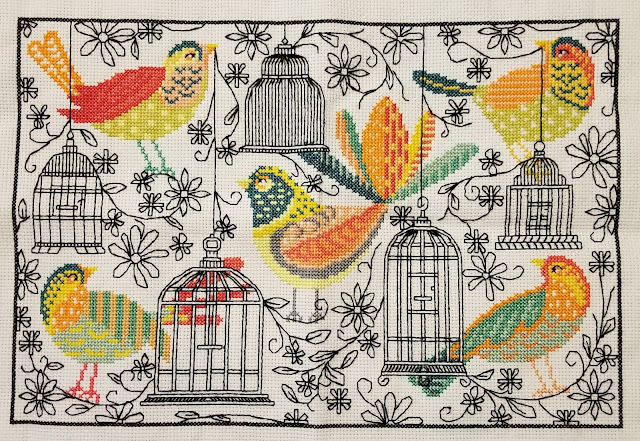 The patterns can be found in the Ultimate Cross Stitch Birds book. 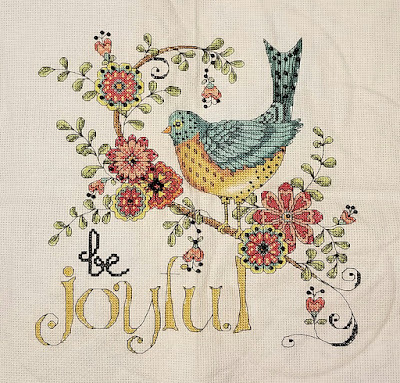 I really enjoyed stitching this Be Joyful piece. It's already hanging on our wall. I lost a few beads in the process of stitching so I'm glad they included plenty! This next piece is titled The Woods Behind My House. I think this one is beautiful, but... I did not like the thread that came with this kit. It broke quite frequently on me while stitching. Overall, I did enjoy stitching it, though. I have the next pieces hanging in our kitchen. 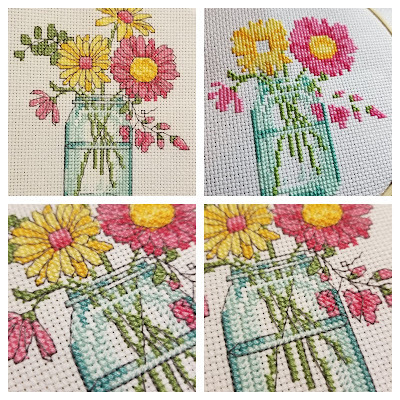 In the magazine, there is a set of four, but I only stitched three of them. I think they are super cute, but I would have liked a bit more backstitching to make them pop. 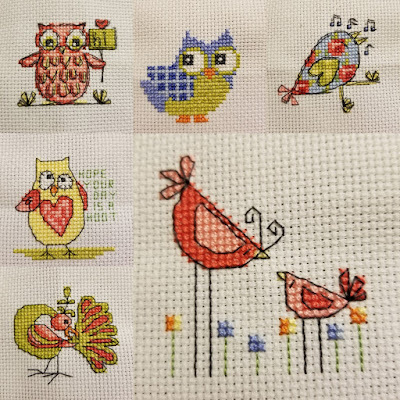 These are found in the August Issue of Cross Stitch Crazy. I had my eye on this Mason Jar pattern for a while. I have also framed this one and it's hanging in our kitchen. This kit came with a hoop, but I chose to frame it instead. 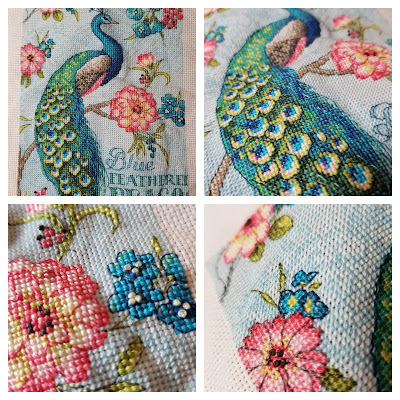 Once I stitched the large peacock, I had to get the kit for this smaller blue peacock. 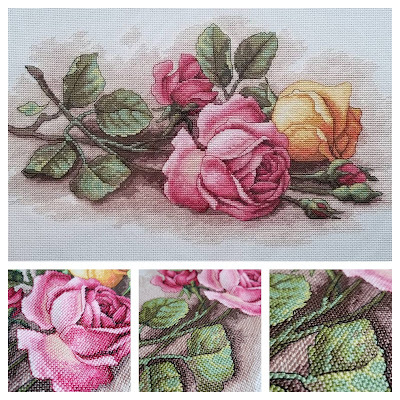 Last but not least, I stitched these beautiful roses and gave them to my mother as a gift. My sweet hubby painted the frame for me. This one is titled Rose Cuttings by Dimensions. If you have current or past Cross Stitch projects, I would love for you to leave a link in the comment section so I can take a look!